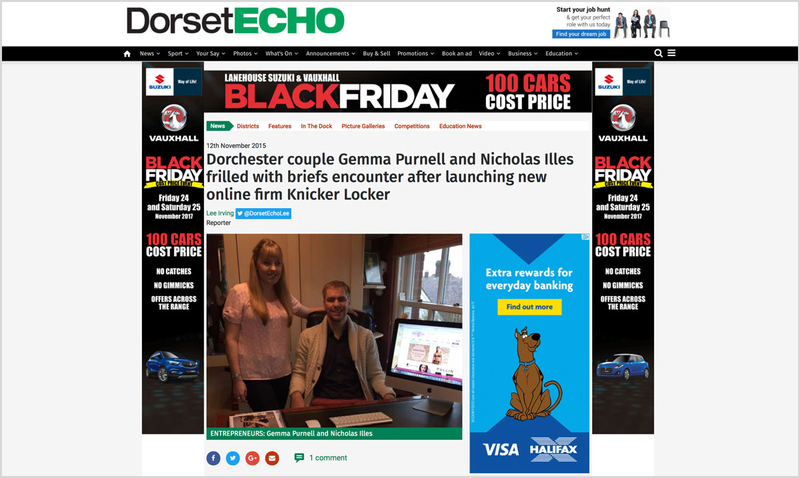 For the official launch of Knicker Locker, we were featured in the Dorset Echo Newspaper as well as on their website on 12th November 2015. This fashion feature in the July 2016 edition of Dorset Magazine showcases our gorgeous swimwear from Fantasie and Freya. The feature on the Underlines website showcased a Valentines Day promotion we did in 2016 with the beautiful B.Sultry bra, knicker and suspender belt set. The gift guide feature in the December 2016 edition of Red Magazine showcases our top christmas gift from B.Tempt'd. B.Sultry in Tango Red is available with matching Thong, Brief and Chemise. 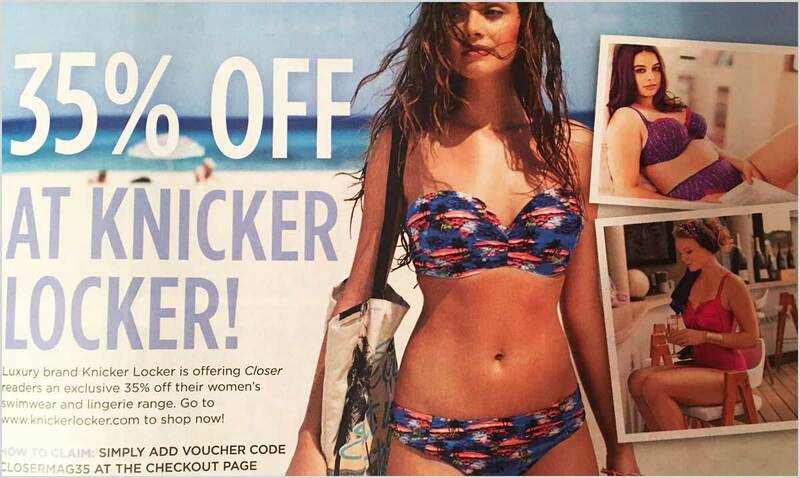 Closer Magazine features our newest ranges from Lepel, Seaspray and Elomi with an exclusive reader offer of 35% off. This was included in their Diet Special. 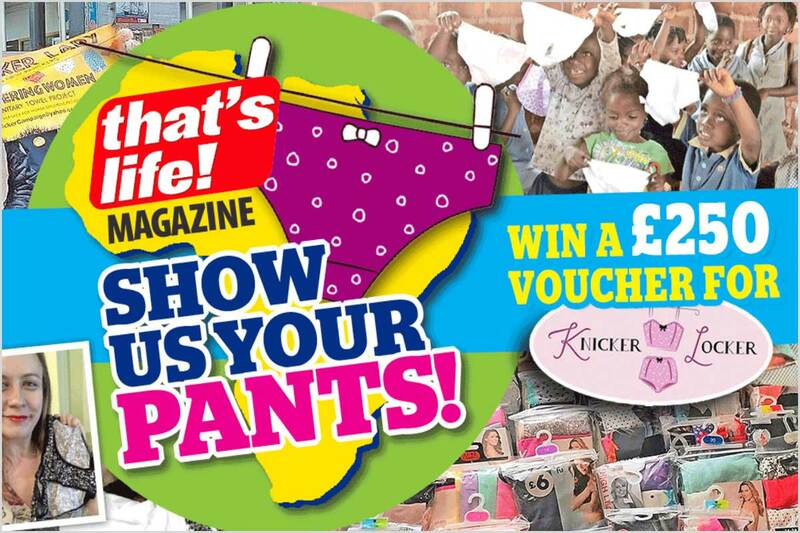 We teamed up with That's Life magazine to help reader Anita Philpott with one amazing cause – collecting brand new packs of pants to send to women who need them in Africa. Every person who took a photo of themselves with the pants you’re donating would be in with a chance of winning a £250 voucher to spend with us. 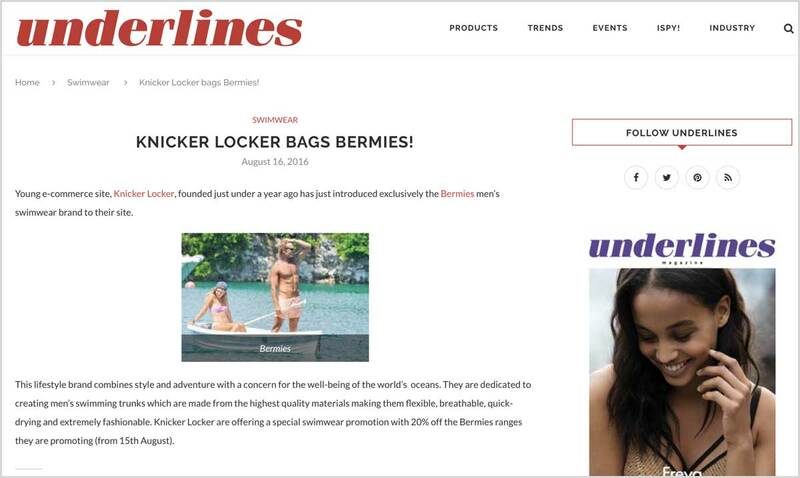 For the launch of our UK exclusive Bermies swim shorts, Underlines Magazine featured us on their website in August 2016. 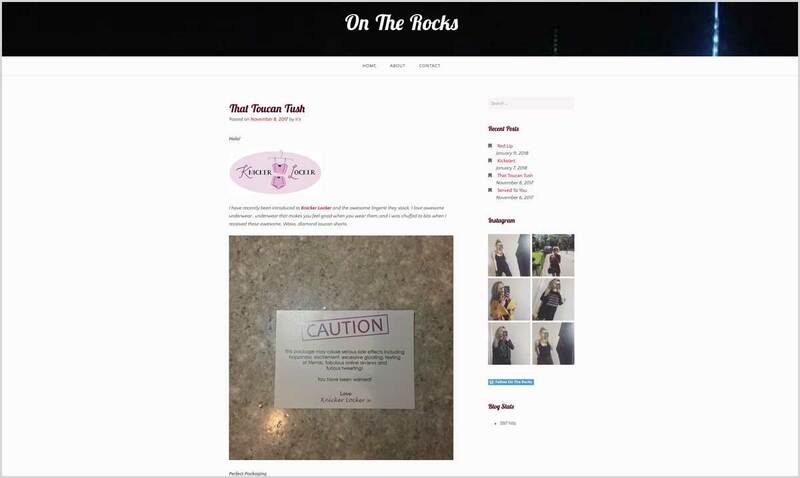 Sian and Char find out about Soak Wash and test it on their lingerie. 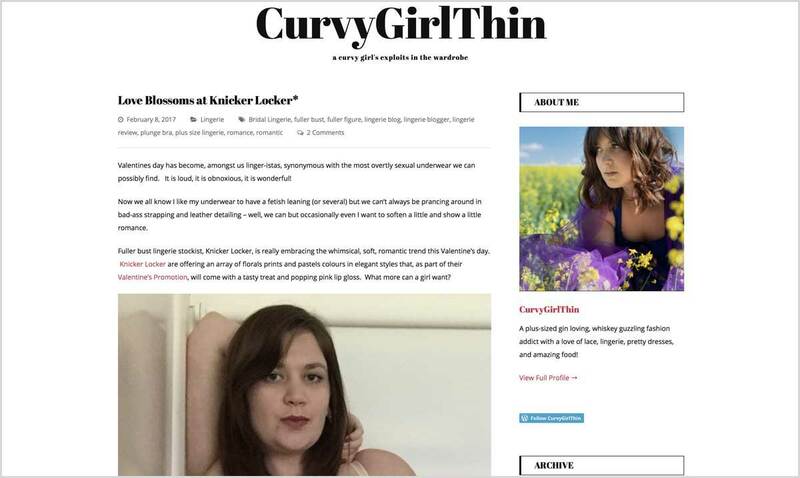 Alice Fair-weather tells us the importance of bra fitting and her own experience. Charli Russon discovers the Tutti Rouge Liliana bra set and our Valentines Day collection. Rachael Sealy reviews the Vanilla Night & Day nightdress and tells you about our recent sale. 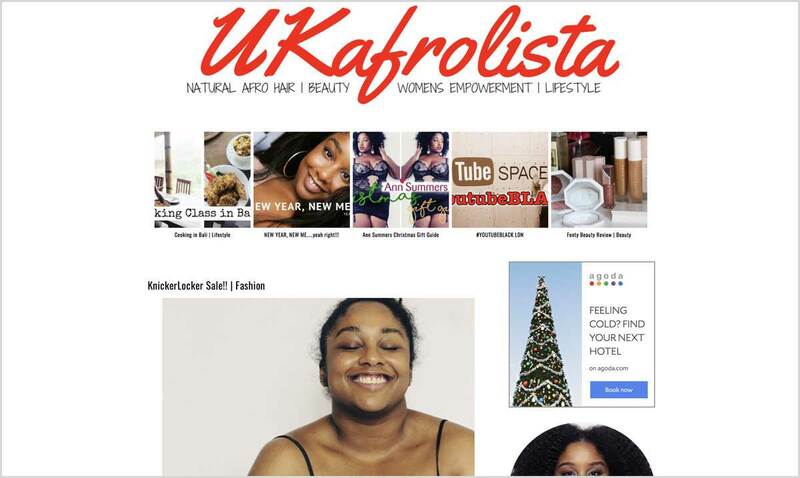 Katie reviews the Elomi Raquel set and hosts a lingerie giveaway for a bottle of Soak Wash.
Sophie reviews the Shock Absorber Multi Sports Support Bra with a special offer. Rachel Montague-Ebbs talks about 5 ways to boost your body confidence and hosts a giveaway to win a Seaspray sarong. Juleigh Newmar reviews the Toucan Shorts from Waxx Underwear. Carrie Rose reviews the Aria Camisole and Short set from LingaDore. 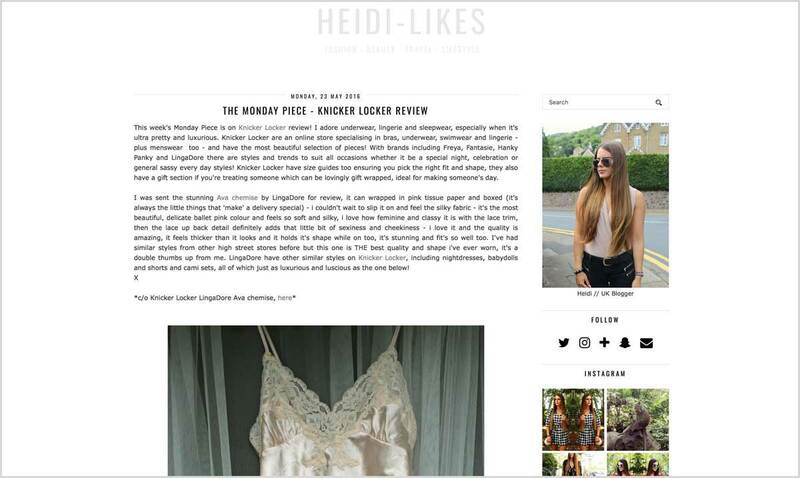 Heidi Thomas reviews the Ava Chemise in Powder from LingaDore. 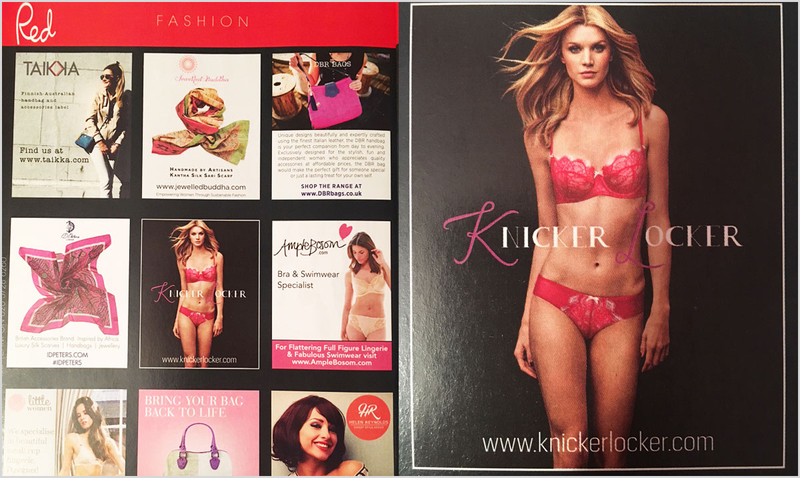 Knicker Locker relaunches website to attract more male shoppers. For the launch of our new website design Underlines Magazine featured us on their website in December 2017. 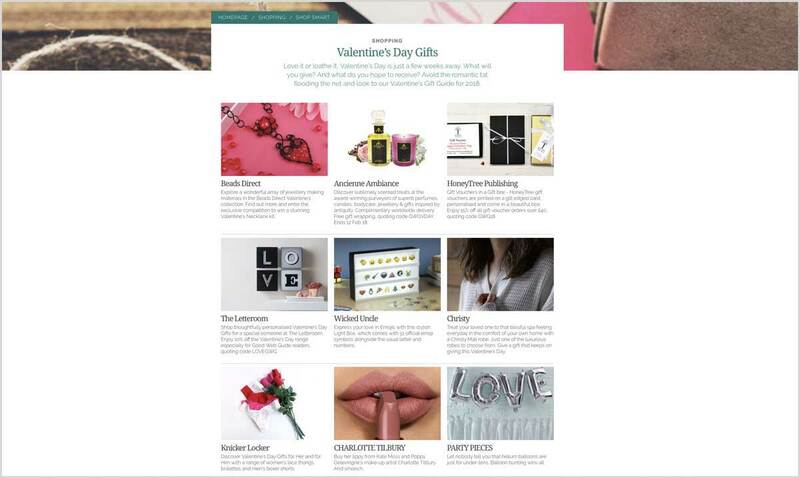 With Valentines Day around the corner, find a choice of top gifts. Valentines Day fashion with the Ciao Bella bralette set and Frivole set at Knicker Locker. 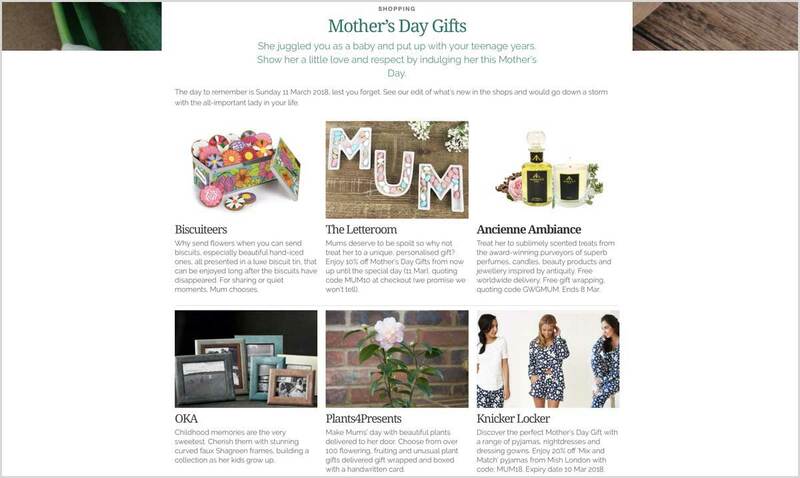 With Mother's Day creeping up, find top gifts for your mum including a special offer with 20% off Mish London. Knicker Locker introduces Lepel London to the website. Dear Drew by Drew Barrymore launch exclusively at Knicker Locker on Monday 14th May 2018. Dear Drew by Drew Barrymore lingerie collection launches on Knicker Locker as a UK exclusive for 4 months. Alice Fair-weather reviews the Secrets range from Ten Cate. 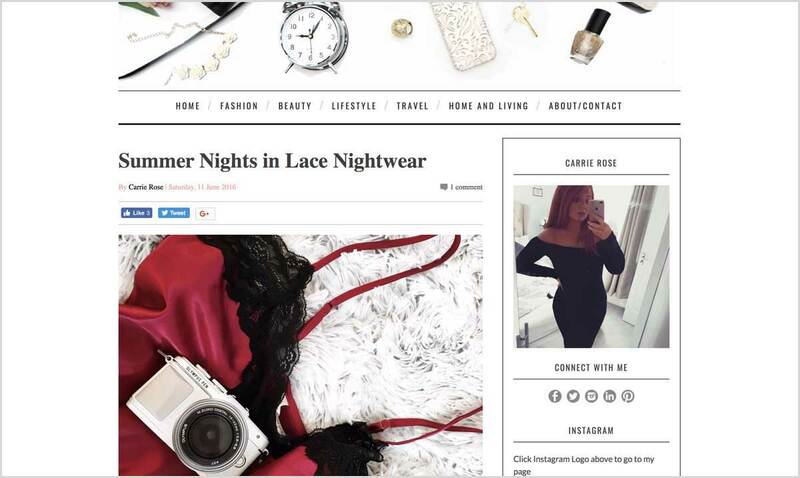 Sian reviews the Embrace Lace Chemise from Wacoal 2 weeks before her wedding day. The beautiful Bonne Nuit bralette from the Dear Drew collection makes the perfect bridal lingerie set. Holly reviews the beautiful After Hours Bralette and launches an Instagram giveaway for one lucky person to win the B.Tempt'd bralette! 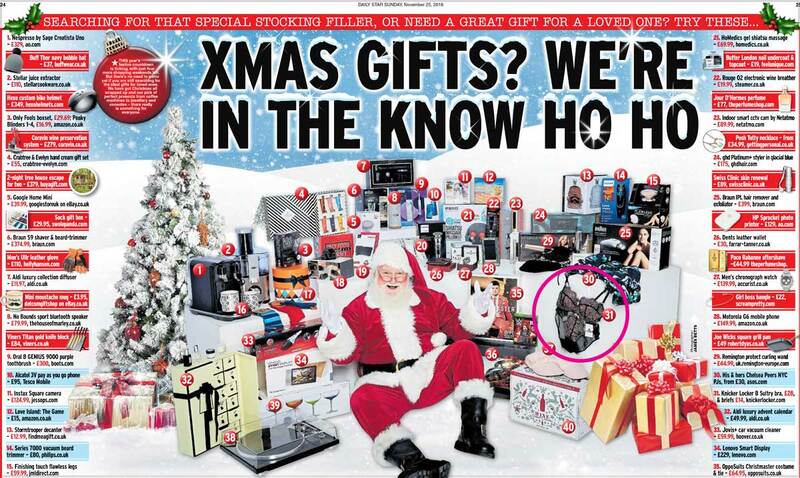 The Daily Star reveals their guide to help you with the seasonal shopping for your loved ones. 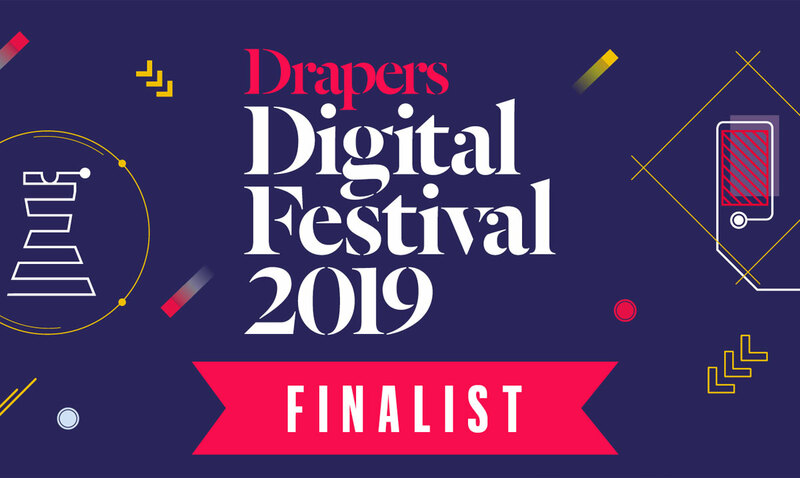 We've been shortlisted for Best Website Design at the Drapers Digital Awards 2019 and we couldn't be more excited about it. Wish us luck!